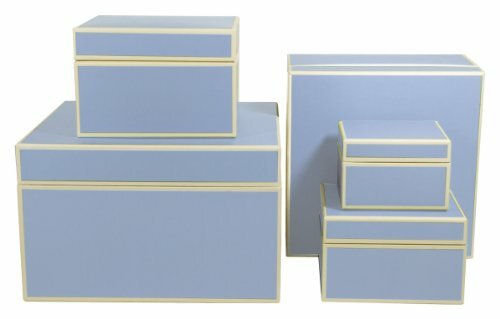 Nesting Boxes, stacking boxes, gift boxes or storage boxes; no matter what you might call them, this set from Semikolon by Pierre Belvedere does it all. For over 50 years, Pierre Belvedere has been a leading designer and manufacturer of fine paper and stationery products. 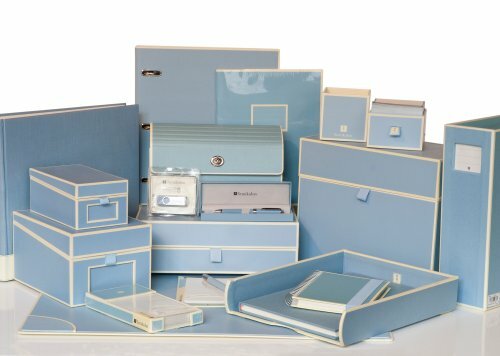 That same tradition of excellence is incorporated into Semikolon's Square 5 box set presented in a fabulous array of colors accented by contrasting cream borders. Made of the highest grade of premium coated graphic paperboard – similar to the type used for many hardcover books - these boxes are made to last. You'll find unlimited uses for this versatile 5 box set. Use the extra large box (11-1/2 x 11-1/2 x 7 inches) to organize and store craft projects. The large box (9-1/2 x 9-1/2 x 6-1/3 inches) is perfect for cards or letters. Fill the medium box (7-1/8 x 7-1/8 x 4-3/4 inches) with gifts of homemade treats. Stash your favorite family recipes in the small box (6-1/3 x 6-1/3 x 3-7/8 inches). And the extra small box? At 4-3/4 x 4-3/4 x 3-1/4 inches it's the ideal way to insure that “good things come in small packages.” Add the finishing touch to your home or office with Semikolon's coordinating Desk Blotters, CD/DVD/Photo Boxes and Document Boxes, also available on Amazon. If you have any questions about this product by Semikolon by Pierre Belvedere, contact us by completing and submitting the form below. If you are looking for a specif part number, please include it with your message.